certain features, which requires the applicable models for yield evaluation in other cereals to be analyzed in this crop. conditions, depending on the specific purpose of the breeding program. Verimin analizi ve değerlendirilmesi tahıllarda ıslah sürecinin önemli bir aşamasıdır. Aljarrah, M., L. Oatway, S. Alberts and C. Bergen, 2014. Variability, heritability and genetic in some agronomic and forage quality characters of spring triticale in western Canada. 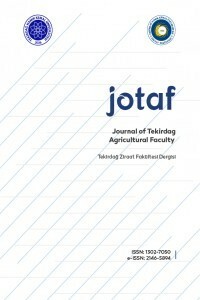 Communications in Agricultural and Applied Biological Sciences, Ghent University, 79(4): 9-18. ISNAD STOYANOV, Hristo . "Karşıt Çevresel Koşullarda Tritikale (xTriticosecale Wittm.) Verim Sıralama Modellerinin Analizi ve Değerlendirilmesi". Tekirdağ Ziraat Fakültesi Dergisi / (September 2017): 77-81.